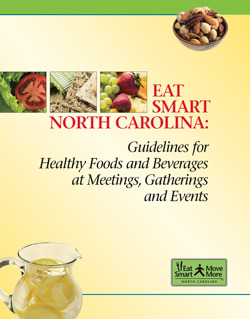 Eat Smart North Carolina: Guidelines for Healthy Foods and Beverages at Meetings, Gatherings and Events (Eat Smart Healthy Meeting Guide) is a planning tool that provides practical guidelines for anyone who is in charge of the food served at events. Whether planning a morning business meeting, all-day statewide conference or afternoon work celebration, making simple changes to the selection of foods and drinks supports attendees in making healthy choices. The Eat Smart Healthy Meeting Guide provides suggestions for offering healthy options for event meals and snacks, tips for working with caterers, frequently asked questions, sample menus and a sample healthy foods policy that can be adapted and implemented by any organization or community group. Standard version for desktop printing and screen reading. Standard version for reduced ink printing. High resolution version for professional printing.